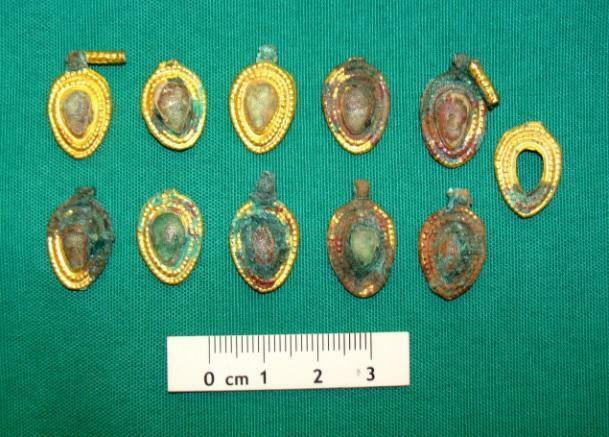 During the excavations of the necropolis in the Ganja-Gazakh region, archaeologists discovered gold and bronze jewellery related to the Khodjaly-Gadabay culture of the late Bronze Age era, local sources reported. Archaeologists noted that part of the burial was destroyed under the influence of natural phenomena and anthropogenic factors. In this case, jewellery found in the necropolis and the remains of ceramic utensils belong to 3,000-2,700 BC. The artefacts discovered during excavations suggest that the burials belonged to the upper class, according to archaeologists. The Khodjaly-Gadabay culture, also known as the Ganja-Karabakh culture, dates from the Late Bronze Age to Early Iron Age in the Karabakh region of Transcaucasia. The eponymous sites are at Khojaly, Gadabay and Ganja in Azerbaijan. The necropolis was excavated by Soviet archaeologists in the 1920s.